For example, under its initially rather confusing SKYACTIVE (the sky is the limit when pursuing new techniques) technical development programme, both the two available power units – a 2.0 petrol and a 2.2 turbo diesel – feature special pistons evolved from race car technology to optimise fuel burn and interestingly share the same compression ratio of 14.1. In the diesel’s case a figure exceptionally low but proven to be near bench-mark effective in practice, both for performance and fuel economy. Then there is a low speed automatic safety braking system ‘Smart City Brake Support’ that operates if the car’s sensory system anticipates a collision with the car in front. Not the sole domain of Mazda but a feature that could help to avoid damage and resulting insurance claims, particularly for those less attentive drivers. As seems the current trend for the class, Mazda is offering the model with a choice of all-wheel drive or two-wheel drive and as things are going I suggest that a strong take-up of the latter and with the diesel unit as the favourite in the UK. Early buyers will qualify for a free navigation upgrade which means a generously sized colour screen with touch control feature, the screen also doubling as the reversing camera. First time out I have logically concentrated on this diesel version which proved a competent performer, the engine delivering flexible power from as low as 2,000 rpm and picking up performance through an accurate changing 6-speed manual gearbox. Clutch action is light and with smooth take-up. The front wheel drive provided grippy handling through the road grade tyres and a sensibly sprung fully independent suspension system provides both a comfortable ride quality plus good stability when coping with cross winds at motorway paces, though there is a degree of body sway on hard cornering. The all disc braking system combines a light pedal action with good response and the powered steering is light but geared about right. Obviously the SUV design means a loftier than standard driving position but it is not too much of a climb into the cockpit and the driver gets a very comfortable driving position, generally good visibility and a business and busy fascia layout. All seats, leather upholstered, are generously padded and are complimented with good head/leg space for all five occupants, though middle rear is slightly compromised by cushion width. Luggage capacity is fit for purpose, being near top of the class, and is augmented by folding 40/20/40 rear seat permutation. There is also a fair amount of oddments stowage around the cabin, an essential requirement with this type of vehicle but it is surprisingly short on cup-holders. Performance claims by Mazda give a top speed of 129 mph and a standing start to 62 mph (100 kph) of 8.8 seconds which is about par for the course with this class of vehicle. The official combined fuel consumption figure of 61.4 mpg, I suggest would ‘boil down’ to around the 45/50 mpg mark according to load/use which is still sensible considering the body size. Fuel tank capacity at 56 litres is a bit small for the class, 60-65 litres would confidently see a range of over 600 miles. These performance achievements, I suggest, prove that a good aerodynamic Cd factor of 0.33 and a weight saving development programme have both proved worthy contributors in the overall development programme. 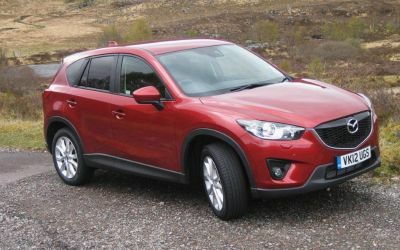 For equipment, including infotainment, the Mazda CX-5 is very competitive, build quality is also to a high standard, interior styling competently executed, panel fit and cabin furniture of good quality trim and material quality looks capable of wearing well and the general impression around the interior is close to Europe’s best. This is not the first occasion that Mazda has emphasised its engine efficiency expertise (I have a sample piston of an earlier Mazda product that proved a resounding success) and SUV buyers should, for once, note the technology that has strongly projected the Mazda CX-5 well up the performance class and will do the same for future Mazda models. Price wise a little more costly to purchase than most in class but should prove rewarding on average and above mileages. SOME RIVALS: Honda CRV, VW Tiguan, Kia Sportage, Audi Q3, Ford Kuga. On road price from £25,595. UK New car registrations rose for a fourth successive month with a 3.5% rise in June to 189,514 units. Technological gains helped average new car CO2 emissions fall 4% to 134.1g/km in first half of 2012.